Rodgers and Hammerstein originally adapted the Phil Stong novel of the same name for a 1945 movie musical, which was remade in 1962. The stage production closely follows the plot of its predecessors, providing a glimpse into the life of the farming Frake family and their three-day adventure at the Iowa State Fair in Des Moines in 1946. While parents Abel and Melissa are hoping to win a few blue ribbons, siblings Margy and Wayne are more interested in finding romance on the midway. USA Today says of State Fair, This may be what the Golden Age of Broadway was really about! 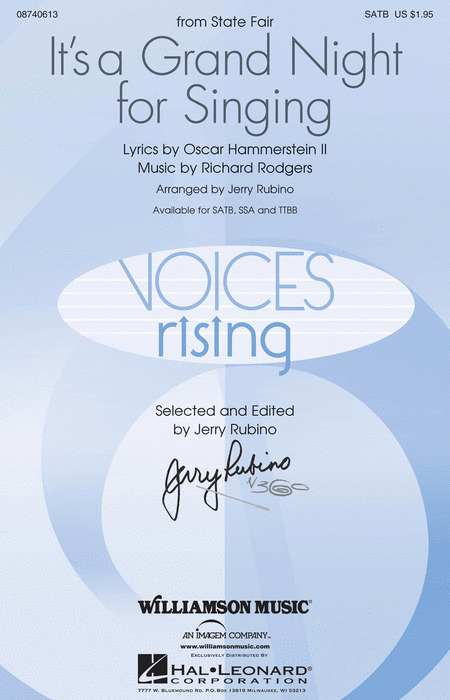 Our deluxe revised Vocal Selections features 11 beloved songs by Rodgers & Hammerstein, a biography, plot synopsis, history of the show and photos! Includes: It Might as Well Be Spring - It's a Grand Night for Singing - Our State Fair - You Never Had It So Good - more. Arranged as a samba, the joy and rhythmic excitement in this classic never stop. Opportunities for solos and duets provide textural variety. Add the optional horns for even more excitement! Available separately: SATB, SAB and SSA. ShowTrax CD and I-Pak also available. Performance time approx. 2:40. From State Fair, this wonderful classic is set in a medium swing with a fun, breezy attitude that's super for developing jazz style. Available: SATB, SSA, Instrumental Pak, ShowTrax CD. Performance Time: Approx. 3:40. Here is the Rodgers and Hammerstein classic in an irresistible vocal jazz setting that really swings over a pulsating groove. A fine showcase for jazz and pop groups! Available separately: SATB, SAB, SSA, ShowTrax CD. Rhythm parts (gtr, b, dm) available as a digital download. Duration: ca. 3:40. Arranged as a samba, the joy and rhythmic excitement in this classic never stop. Opportunities for solos and duets provide textural variety. Add the optional horns for even more excitement!Available separately: SATB, SAB and SSA. ShowTrax CD and I-Pak also available. Performance time approx.2:40. Arranged as a samba, the joy and rhythmic excitement in this classic never stop. Opportunities for solos and duets provide textural variety. Add the optional horns for even more excitement!Available separately: SATB, SAB, and SSA. ShowTrax CD and I-Pak also available. Performance time approx. 2:40. ...and it will be with this dynamic contemporary setting from Broadway's State Fair! Available: SATB. Performance Time: Approx. 2:20.